webElect.net allows you to print pre-filled petition and AB request forms so electors only need to sign and date the form to complete it. Forms are barcoded with the voter's registration ID helping you (and often the SOE office) track and verify the completed forms using a barcode scanner. There are a few workflows typically used to complete the petition or AB drive and are explained below. The forms require some initial setup by the campaign for the fields related to the campaign and election. These are found on the "Campaign Setup" link from the Main Menu and under the sections titled "Petition Form Options" and "Absentee Form Options". This page is only accessible by Administrative level users. Sometimes you only need to print a single form for a voter that may be visiting the campaign office, or possibly a volunteer wants to print a few forms for some friends. Look up the voter using the search bar at the top of the Main Menu. Click the "Voter Details" icon under their name. Find the "Output Options" section on the page and select the form format you would like to print. Click the "Print for Voter" button to print a form only for that specific voter, or "Print for House" to print forms for all electors in the house. If you are going to walk neighborhoods you may want to take the opportunity to collect petition forms (or collect AB requests for the electors that indicate their support for you). 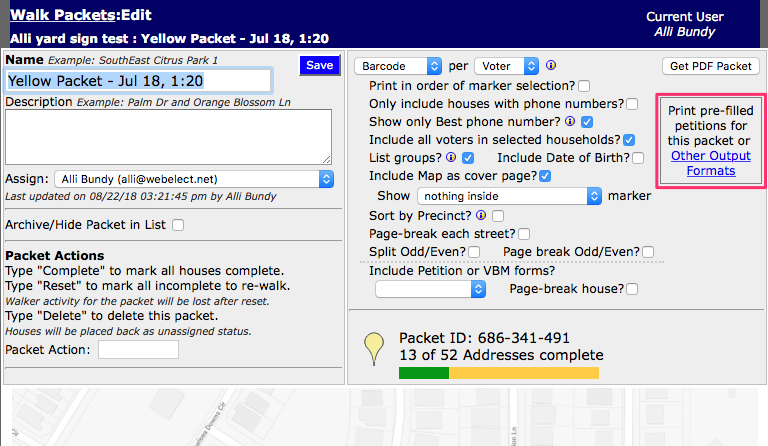 Create your walk packets using the Walk/Canvassing module . Select the petition form layout you would like in the drop down under "Include Petition or VBM forms?" Optionally choose if you want to page break between houses. 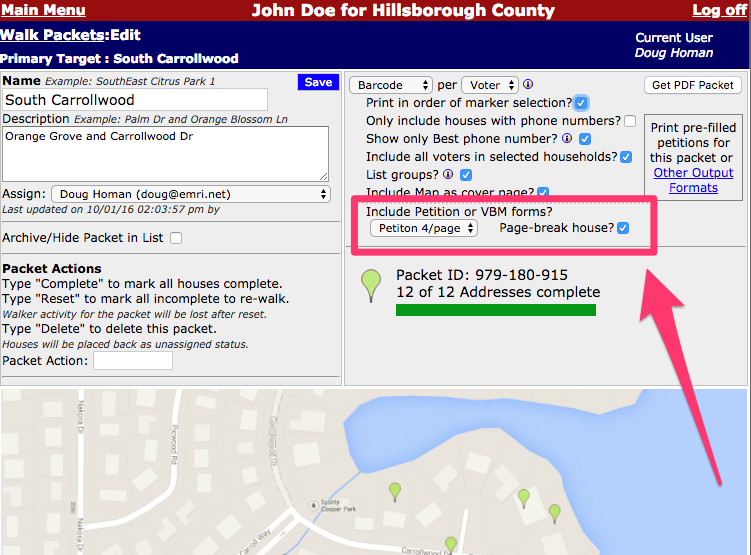 If page breaking and using a multi-form layout, blank forms will be completed with the candidate information to assist with collecting additional petitions from non-targeted voters. This technique is useful if you will be attending an event in which a known list of electors will be attending and you would like to have pre-filled forms for attendees to easily complete. Create a Group to place all the attendees in using "Group Management" link on Main Menu. Add the electors to the Group individually via name lookup as they RSVP, or via bulk loading if you have a list with Voter ID numbers using the Barcode page for the group. If you would like to bulk load a list but only names and addresses are available, email the list to support@webelect.net and we can match the records to electors by CASS processing each address and matching via name and address. This incurs a $35/list charge. Once you are ready to output the forms to take to the event, click the "Targeting" link on the Main Menu, skip the first 2 pages until you get to the Group Criteria page. Click the first column for the Group that contains the attendees (Keep if Member of) and click "Next Page". On the Query Process Options, Click "Show Options" for the "Petition/AB Forms" section. Now select the form format you would like to use. If you think your attendees are likely to bring additional guests from their house, check the box to include all voters in selected households. That will print a pre-filled form for every elector that has the same address as someone in the selected Group. If you do not plan to let the attendees take the forms home with them and instead want them to be signed and dated on site, you can keep the sort order to "Name". That will print all forms ordered by last, first name as they are registered with the SOE. However, ordering by Name does not allow you to page break. You may instead find it more useful to sort by address and use one of the page breaking options as described in step 8 above. This is also necessary if you plan to allow the attendees to take the forms home with them, as "Each House" will need a page break. Let us know if there are other ways you are using or would like to use the preprinted forms and we will document the process. There are different ways to print prefilled petition forms in webElect. You can run a general target/query, you can query a group you've made, you can print petitions for a Walk Packet you've made, or you can look up an individual voter and print a petition for them. For a visual example, see our Printing Prefilled Petitions video. Go through Query/Targeting on the Main Menu, then "Next Page" to get to group criteria. 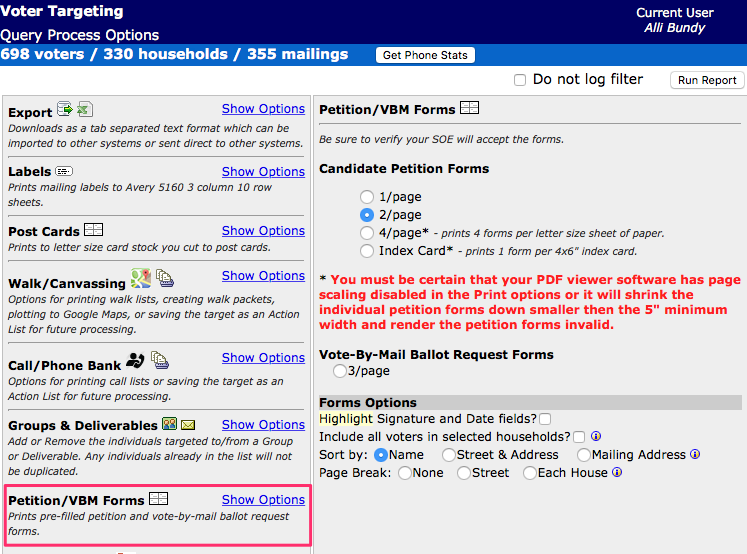 Use the Output Options section to select your specifications, then click "Print for Voter"
We have added the ability to print petition forms in the exact order as the walk list when printing walk packets. If you select the markers in the order you want them walked and use the "Print in order of marker selection" option to order your walk packet, you can now get a list of petition forms in the same order. Even if you do not use the ordered by marker selection option and chose the default ordering by street name and number (and optionally split odd/even addresses), the petition forms can be printed in the exact order to assist in breaking packets down and matching to the forms.